AOL Backup Tool to allows you to choose the format according to your desktop email client. It provides a variety of email file formats like PST, EML, MSG and MBOX that can be chosen for creating email backup accordingly. For instance, if the user is having MS Outlook application in his system, one can backup AOL emails in PST file that can be accessed in Outlook locally. The AOL email backup tool is considerate and equally advance equipment that can create a backup of the emails of AOL accounts to be saved on the hard drive. 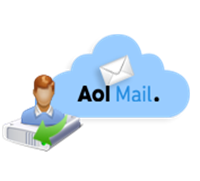 Export AOL email to PST/MBOX/EML/MSG within limit of 100 emails and expires after 30 days. Get Your AOL Emails Securely Saved in Local Hard Drive! Email Filters are available to perform backup of required emails only. Users can choose the folders to be backed up where the unwanted folders can be avoided. Date range based filters can be also applied in order to perform email backup of email belonging to particular date range. There is a significant option to manage the Internet Bandwidth while downloading the emails to hard disk. This can be done by providing the gross Internet speed and percentage of it to be used by product. Tool also emphasizes on backup of chats (AIM) of AOL account and if user wants to back up the chats as well. This lets you take complete backup of emails from various folders and chats as well. Users can create the backup of AOL emails and store it in local hard drive using AOL Backup solution. This software is also available as demo version and hence can be downloaded to test the product, its features and its working.